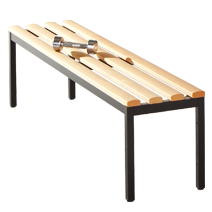 Your factory equipment is rounded off by cloakroom benches by EUGEN WOLF. 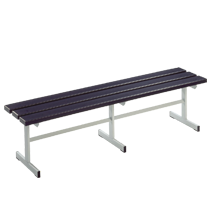 Resilient frames, seats made from PVC or beechwood, as one-sided or two-sided models and in three different lengths. Designed exactly according to your requirements and wishes. With 3 seats made from WPC hollow chamber profile 105 x 35 mm, with PVC cladding and screwed end caps. Frame made from welded rectangular tubes 50 x 20 x 2 mm and 40 x 20 x 2 mm with lengthwise reinforcement made from angle steel. Feet with scratch-proof plastic gliders. Available in 3 different lengths and 3 seat strip colors as a standard. High-quality stove-enamel, RAL 7035 light gray, special finishes possible on request. With 5 seats made from WPC hollow chamber profile 105 x 35 mm, with PVC cladding and screwed end caps. One-sided model with backrest and integrated coat rack. Frame made from screwed rectangular tubes 50 x 30 x 1.5 mm and 30 x 30 x 2 mm. 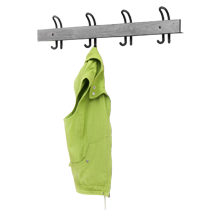 Concealed double coat hooks made from plastic. 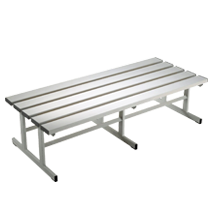 Seat strips, backrest and hardwood coat rack, slightly steamed beech, 60 x 25 mm, with rounded edges, colorless finish or alternatively PVC with reinforced galvanized metal profile, color: brown or gray. High-quality powder coating RAL 9005 jet black. Optional shoe rack also available for retrofitting. 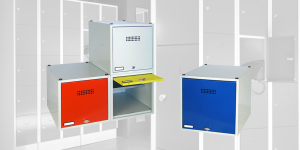 Additional models such as stainless steel available on request. 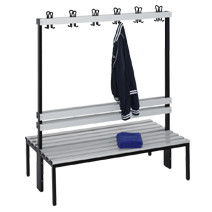 Two-sided model with backrest and integrated coat rack. Frame made from screwed rectangular tubes 30 x 30 x 2 mm. Hardwood seat strips, slightly steamed beech, 60 x 25 mm, with rounded edges, colorless finish or alternatively PVC with reinforced galvanized metal profile, color: brown or gray. Hardwood seat strips and backrest, slightly steamed beech, 60 x 25 mm, with rounded edges, colorless finish or alternatively PVC with reinforced galvanized metal profile, color: brown or gray. Frame made from screwed rectangular tubes 50 x 20 x 2 mm. Seat strips made from resistant HPL (High Pressure Laminate). 3 decor styles to choose from, light gray, basalt gray or London Oak Silver. 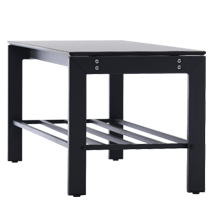 High-quality structure, powder-coated similar to RAL 7024 graphite gray. Additional extensive selection of special decor types available on request. Sturdy rectangular tube 50 x 20 x 2 mm with resistant HPL veneer. 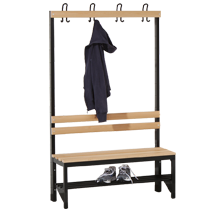 Shoe rack for sitting and cloak room benches. Sturdy construction made from welded rectangular tubes. 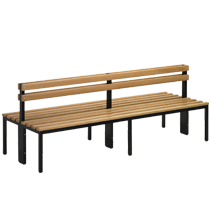 For one-sided and two-sided benches.